To be on the left, to dream and organize for a better world, is inherently a transgressive act. To transgress is to test boundaries, to ask why they were there in the first place, and to demand they be reshaped. It is also a key part of what it is to dare to experience life as a human being in a profoundly inhuman world. Red Wedge’s sixth issue, “In Defense of Transgression,” is dedicated to exploring this through the prism of art, culture, and the socialist vision. At 140 pages, it asks very simply what the transgressive act looks like in the realm of human creativity, and how artists and organizers can defend and build upon it. Available for purchase through Amazon.com in the United States, the United Kingdom, Canada, and across Europe. 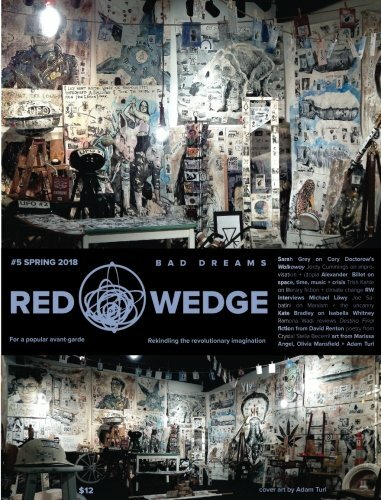 Red Wedge #5: "Bad Dreams"
Modern life for millions is a nightmare. Climate change is threatening our very notion of a stable and natural reality. The far right is ascendant in a growing number of countries. Neoliberalism, in all its exposed cruelty and indifference, continues to stride along on the back of its most effective mantra: “There Is No Alternative.” Should we even bother with dreams of optimism, of anything better? We don’t have a choice. We can’t afford to give up the dream, but we will also be woefully unprepared if we don’t face and examine the nightmare, even acknowledge the ways in which the threat of oblivious spurs us forth to create something better. As the song says, “from the ashes of the old…” Red Wedge’s fifth issue is devoted to unpacking these questions. Red Wedge #4: "Echoes of 1917"
It has been a century since the Russian Revolution. The occasion has naturally provoked all manner of commemorations. The establishment calls it an unfortunate sequence of events never to be repeated, the right spits its vicious bile at the memory of a workers’ world, and the Left, to one degree or another, celebrates and analyzes and tries to ask how to make the history come alive again. Red Wedge has a few ideas regarding this last point. To us, the art, the poetry, the music, the performance, the mass imagination unleashed by these events; are worth not just revisiting and understanding on their own terms but engaging on their own. If art encourages us to imagine ourselves beyond the confines of our time and place, then anyone committed to radical social change must ask how in 1917 that vision traced a line from what was to what could be, and whether that trajectory has any meaning for us today. Red Wedge #3: "The Return of the Crowd"
Seventy pages on the return of "the crowd" to modern politics and its meaning for a new, vital, radical cultural practice. From Nuit Debout and Black Lives Matter on our end of the spectrum, to the horrifying rise of Donald Trump and right-wing populism, there is no getting round the fact that "the masses," in some form, matter to politics again. How this impacts the formation of a new left, along with the practice of musicians, writers, painters and sculptors, filmmakers and performers, is an open question. One with a huge amount of meaning for the imagination of radical social change. While "popular" and "avant-garde" appear at odds with each other in contemporary culture, Red Wedge sees them, like others before us, as torn halves of the same whole. Rejoining them is to liberate art, and can only be accomplished through artists allying themselves with revolutionary struggle. This pamphlet is a pillar of Red Wedge's political and artistic outlook. Arguing for a re-orientation of radical artistic production, it cites examples from Frida Kahlo to Rock Against Racism in an attempt to re-forge an artistic practice that puts the radical imagination at the center while shunning the commodification of the culture industry and the isolation of the underground. Red Wedge #2: "Art Against Global Apartheid"
Roughly one hundred full color, illustrated pages of essays, commentary, poetry, art, comics and reviews. "Apartheid" in today's world does not describe only a particular legal circumstance in this or that corner of the globe. Art, literature, music and creativity, in a very basic sense, are a bending of time and space, a defiance of the ways racism, capitalism and imperialism have shaped our world. They dare us to imagine over the walls. Red Wedge No. 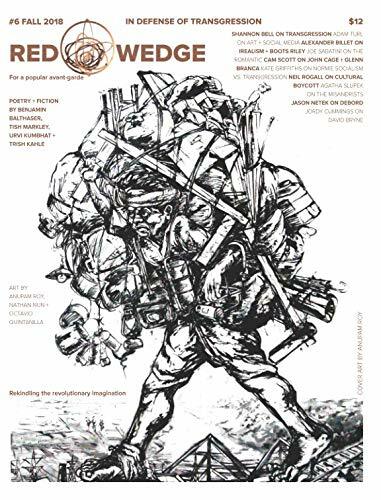 1: "Art + Revolution"
Red Wedge's first full print issue, with a variety of features examining the intersections of art and political revolt both both past and present. Seventy-six pages. Issue Zero: "The Thunder of New and Dangerous Myths"
Red Wedge's inaugural pamphlet and manifesto, published in 2014. A rough statement of the challenges facing art, artists and radicals concerned with cultural production. Sixteen pages, featuring full-color design and illustrations from Hope Asya.